Are you tired of the generic off-the-rack suits that are just never what you’re looking for? Or maybe you have a specific suit in mind and it turns out that somebody got the last one? Well at R.W. Furr Clothiers, you never have to worry about that again! 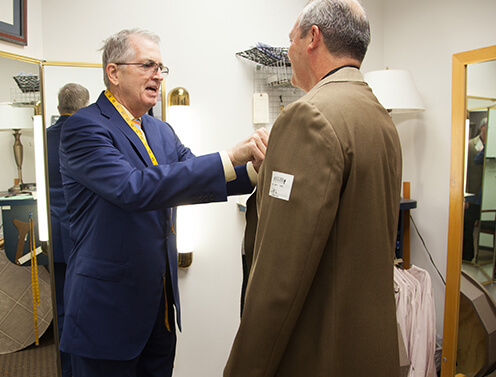 Rex’s custom suits in Dallas, TX offer an extensive selection of the finest fabrics in the world! Rex has set the standard for quality garments and developing “winning” wardrobes for men of rank and responsibility. 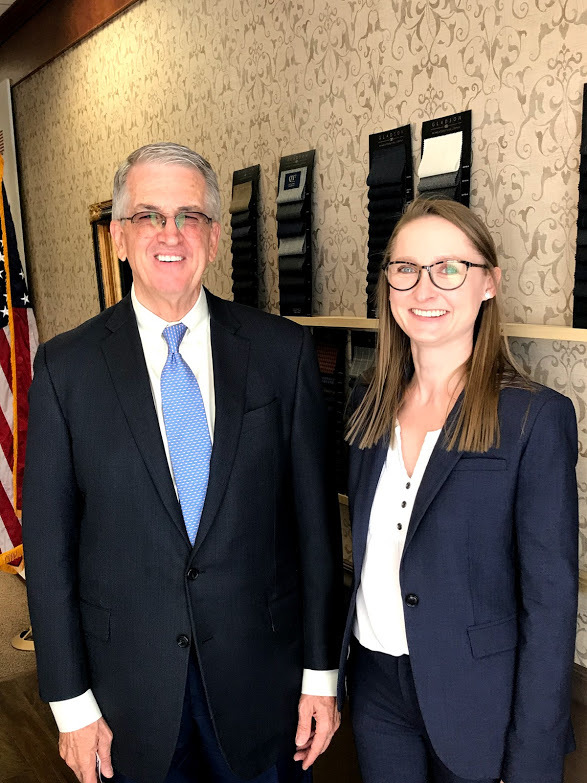 For more than 200 years, the proper business suit has been a staple for men of prominence, yet it is one of the most overlooked forms of communication. More than any other item of clothing, the suit ultimately determines the overall style of a man’s dress. The right business suit avoids bland conformity, reflecting instead a sense of one’s self-esteem, priorities, and even one’s state of mind. Fine custom clothing should suggest character and individuality. Like a good haircut, the cut of a suit should never call attention to itself. The silhouette determines a garment’s longevity, so, therefore, should be your primary consideration. The fabric and details, which may add to a suit’s attractiveness, and even to the fit, should be your secondary concern. There are three basic silhouettes: Italian, British, and American. R. W. Furr Clothiers designs suits that look good on the American physique, eminently proper and stylish, yet without the studied elegance of the Europeans. Trendy designer clothing tends to impose itself on the body and follows the whims of fashion. An R. W. Furr suit is designed to allow the materials to subtlety adapt to the wearer’s physique. For example, modified natural shoulder looks can only be achieved through softness of line with a drape that follows the shape of the body, then slightly tapers at the waist. For the ultimate in softness and natural drape, all our coats are hand-tailored using hymo with horsehair, the finest coat-front made. The result is clothing that looks yours and yours alone. Our classic styling is available in two-button, three-button, or double-breasted models. The wearer of a suit cannot see himself as others do: from a distance, at all angles, moving or standing. 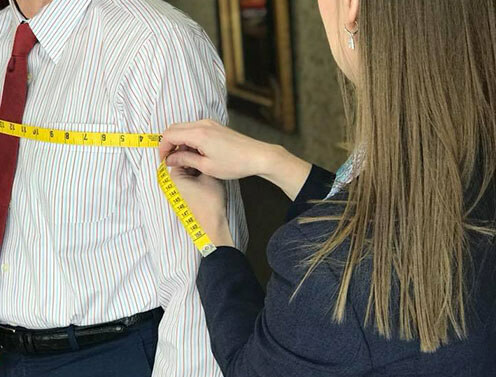 Our specially trained tailors depend as much on what their eyes tell them as what the tape measure says. 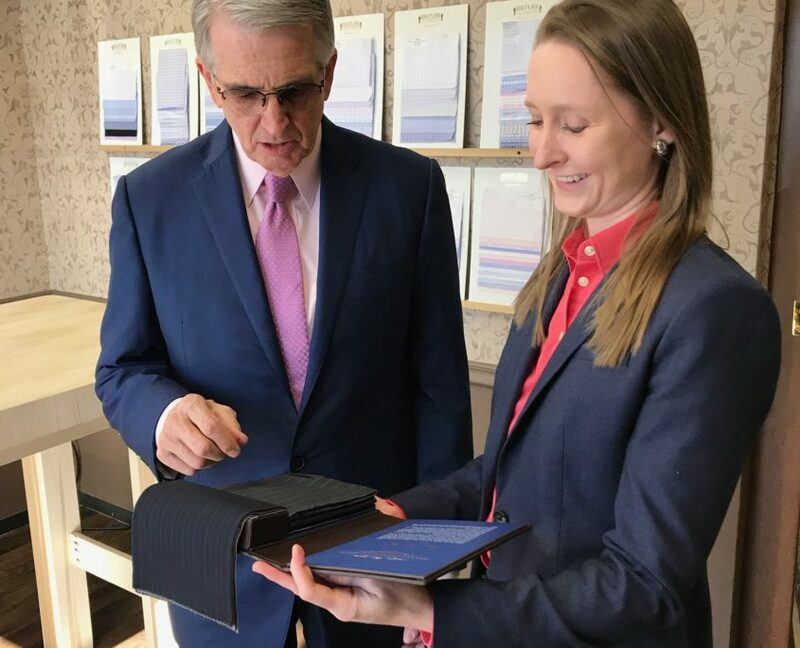 After a fitting, our tailors make gentle adjustments to your paper pattern that result in the masterfully tailored garment all customers of R. W. Furr have come to expect. All clothiers extol their virtues, claiming that their garments are “hand-made,” even when the only contact their “tailors” have with customers is by fax or mail. What distinguishes R. W. Furr Clothiers is that the tailor who makes your pattern will fit you personally. Perfection in custom apparel is high-touch, not high-tech. 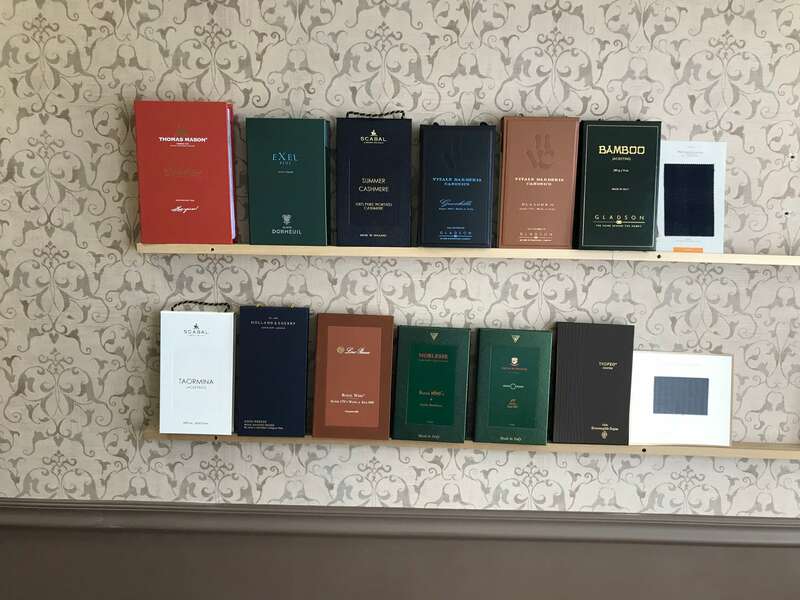 Equally important, we listen to, advise, and counsel you on each aspect of your appearance, helping you refine your own sense of style and taste. After wearing a fully custom suit or shirt from R. W. Furr, all generic clothing becomes passe. Ready-made suits are cut in short, regular, long, and extra long, with a 1.5-inch variation in length from size to size. Most men are between sizes, resulting in coat lengths out of proportion to their height. Although rack suits can be altered, they cannot be balanced to your unique physique. Left and right shoulders don’t always slope exactly the same way, and the curve of the back differs from person to person. Shorten the coat and the front pockets are now too close to the bottom and out of balance with the rest of the jacket. Collar doesn’t quite hug your neck? Shorten the collar, but now the jacket hikes up in the back. This is where R. W. Furr comes in. 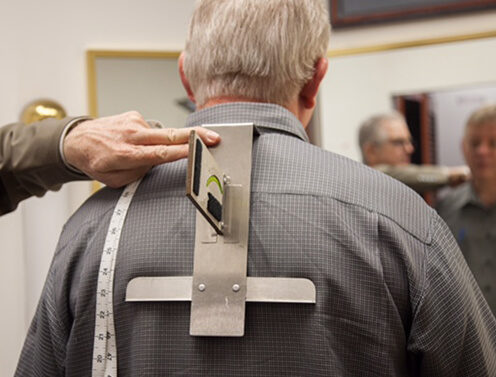 Sophisticated measuring devices allow our tailors to determine your precise form. 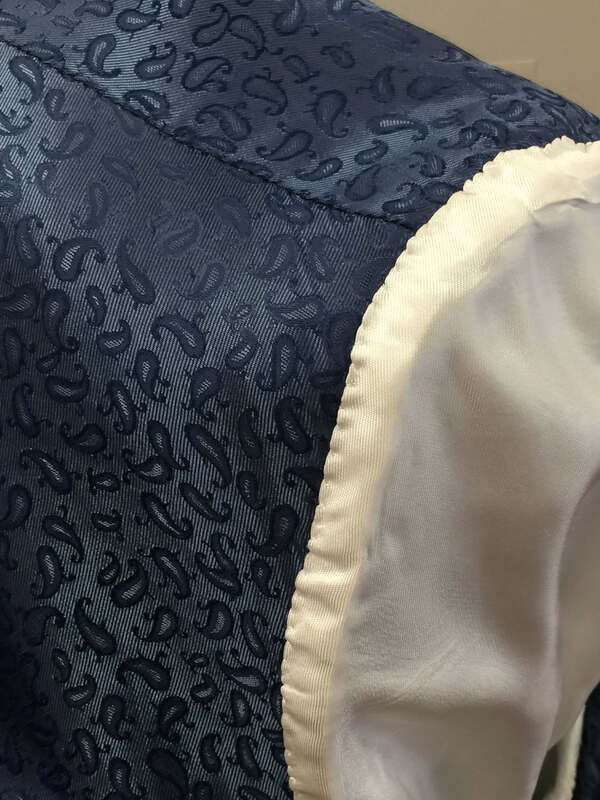 Proper balance is achieved by correctly interpreting measurements and producing a pattern made uniquely for you. Over the past three decades, we’ve learned a lot about fabrics and the people who make them. 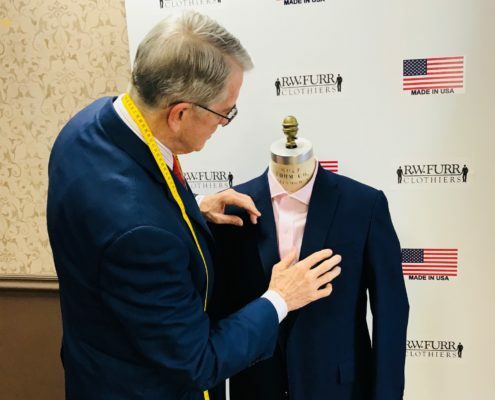 The R. W. Furr philosophy on fabric for suits is consistent with offerings in sports jackets and formal wear: consummately impressive–what clothing is all about. We only deal with the very top mills producing the finest quality with the best reputation. Most of our fabric comes from England, Italy, Switzerland, and France. We visit these mills so that we can keep our customers abreast of upcoming style changes and advise them accordingly up to 18 months before they’re reflected in the stores. The current trend in men’s apparel is to label cloth by thread count, stressing the fineness of the yarn with terms like “super 150’s,” but that is only one factor for evaluating fabric. An analogy could be drawn to the automobile: high horsepower is not necessarily the measure of a great car. When selecting fabrics, subjective factors such as tensile strength, softness of the yarns, spinning, weaving, and finishing are just as important. Wrinkle resistance and wearability are determined by the tightness of the crimp in the yarn. Four-harness cloths wear the best. They only come from the finest mills, generally those that have been in existence for more than 150 years. Considering how much you will enjoy wearing your apparel, it is important that the fabric performs and wears well. 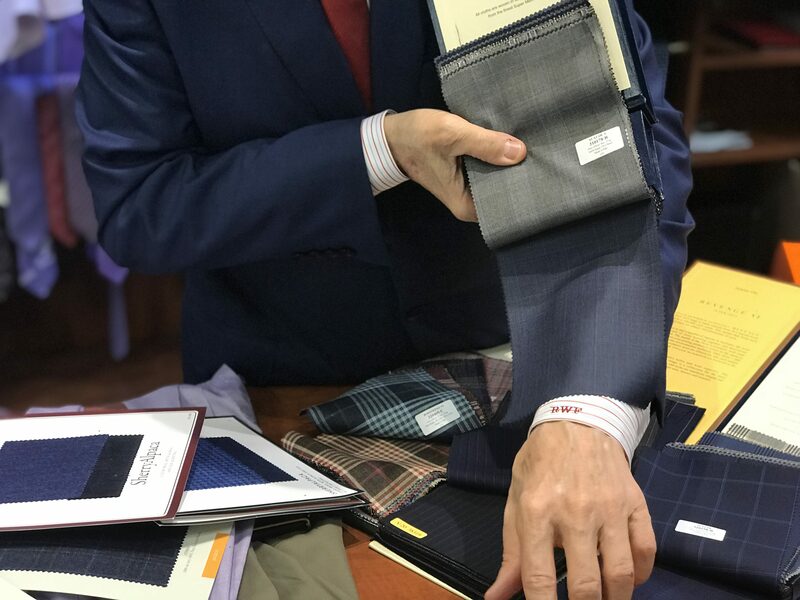 Your personal tailor at R. W. Furr Clothiers takes all these factors into consideration, then draws from our selection of more than 2,100 fabrics to make recommendations that assure you of getting the right weight, color, and pattern to meet your needs. Selecting the fabrics from which your suit will be made is where your own individuality and creativity come to the surface. The common denominator among all savvy dressers is an appreciation of taste and quality. Only the finest materials made in the traditions of classic tailoring evade the perils of changing fashion. R. W. Furr suits, shirts, and pants are superior to better ready-made, semi-custom, or special-order suits. Our philosophy has always been: let the clothing do the talking. Assembly materials are the best we can procure and all aspects of hand tailoring are applied for the highest quality possible, including Bemberg lining, hand-sewn and taped collars, and zinc-coated zippers for smooth and reliable wear. We make clothing for our customers only. This means the demands of a mass-volume “factory” do not distract us. All our energy and effort are directed toward making clothing that fits better, looks better, and feels better than any comparably priced garment available anywhere.